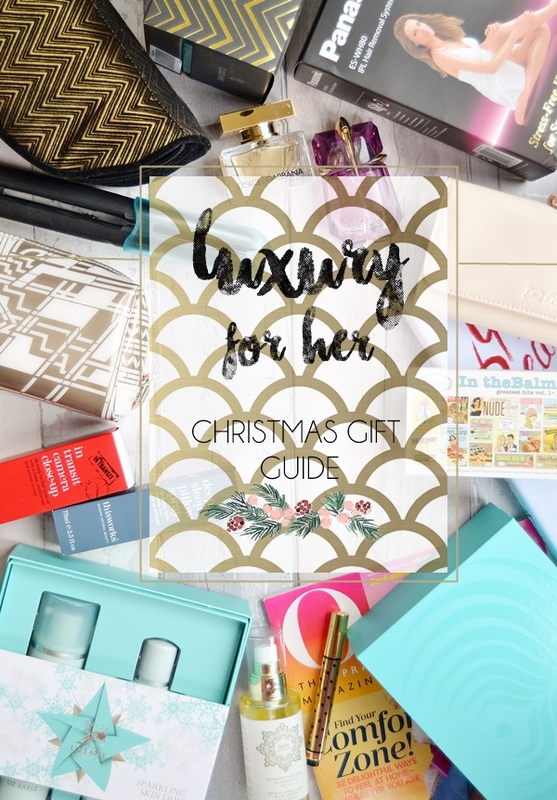 After sharing with you quite a lot of bargain buys in my previous gift guides (Under £5 Gift Guide and Under £15 Gift Guide) I thought it was time for a little luxury! Christmas is certainly the time of year to hope for something special, it may be your signature scent, a luxury skincare set or a total surprise! This guide is both to inspire if you are still doing your Christmas shopping and for possible splurges after Christmas in the Boxing Day sales! 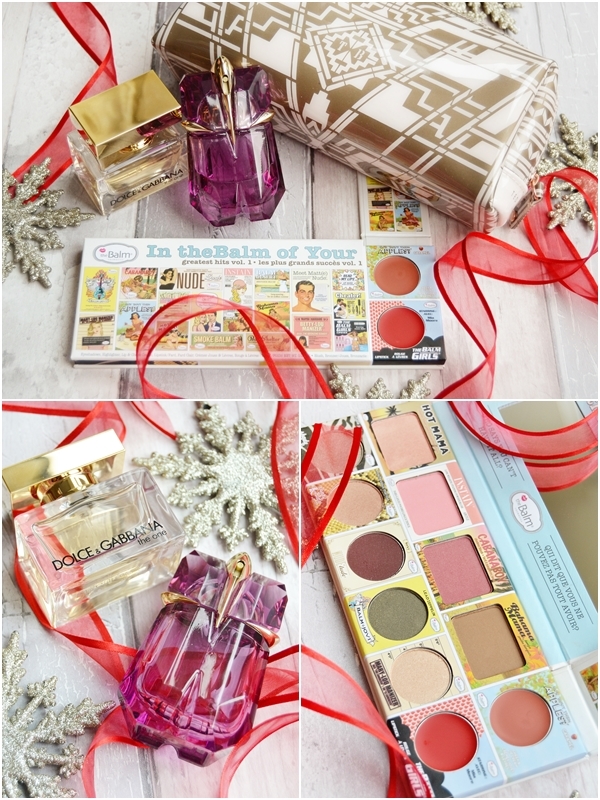 If you're a lover of theBalm then you will probably be swooning over this palette right now. This is a combination of best selling single products and various shades from other smaller palettes to create one amazing palette. Included in the palette - 3 blushers, 1 bronzer, 1 highligher, 4 eyeshadows, 1 cheek & lip cream and 1 lipstick. The stars of the show here are Mary-Lou Manizer Lumizer, Hot Mama Blusher and the 4 eyeshadows from various theBalm palettes. Just an amazing palette for someone that loves theBalm! Side note - Finally a brand has figured out a way to separate cream products from powder ones in the same palette! Fragrances are the perfect item to give and receive at Christmas, I know I'm hoping for at least one new scent. There are so many new launches this year but two of my favourites are Thierry Mugler Alien (EDT 30ml - £39.99 Boots here) and Dolce and Gabbana The One (EDP 30ml - £37.99 Fragrance Direct here). Both are such classic scents that I know many people love. But if you really want to go down the luxury route a fragrance gift set of the recipients favourite scent will be a total hit I'm sure. If you know a fellow beauty lover than a lovely gift to give them is a high end makeup/wash bag as it's generally something that people don't often buy themselves. Ted Baker offer an amazing range of wash bags that are high quality, structured and importantly wipe clean. The above makeup bag is now sadly discontinued but there are so many stunning designs on the Ted Baker website. 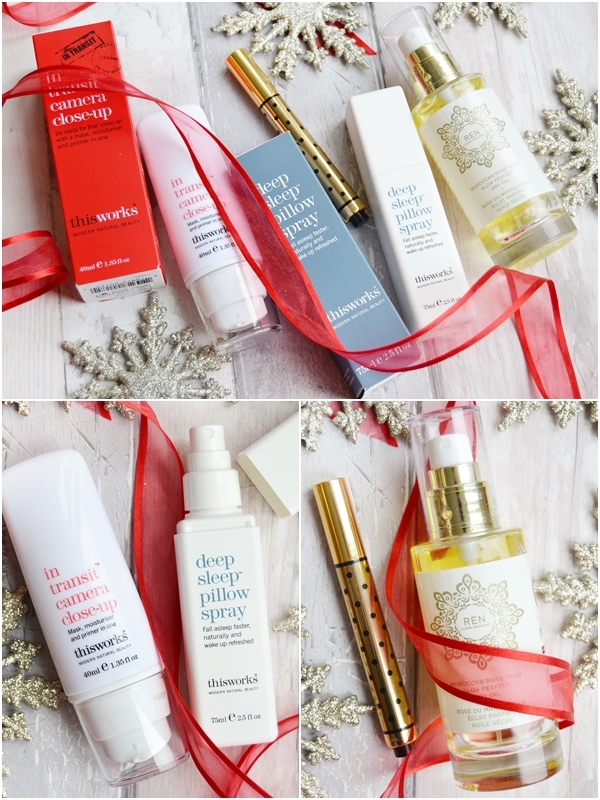 If you know someone that is into their skincare than a high end skincare set is a perfect gift to give them. Of course you have to be aware of their skin type and any allergies they may have but a brand that is perfect for nearly all skin types and needs is Liz Earle, you really can't go wrong with it in my opinion. The above set is an ideal gift if the recipient is new to Liz Earle or loves the brand as it contains the star product of the Cleanse & Polish Hot Cloth Cleanser with 2 muslin clothes and the highly rated Instant Boost Skin Tonic. A great all-round set for any age that will cleanse and brighten the skin a dream. If you have a little more to spend than Elemis is the skincare brand to look at. This year they have some amazing gift sets that are beautifully presented including this amazing Pro-Collagen set that contains their excellent Marine Cream. What I love about this set is that it's true luxury, from the 3 quality products - Pro-Collagen Marine Cream, Eye Renewal and 2 Hydra-Gel Eye Masks, to the turquoise box that is so stunning that it could easily be used as a jewellery box or trinket box. This is just a stunning luxury gift that I'm sure anyone would be thrilled with! This Works is a fairly new brand for me but as I've been so impressed with the products I've tried I really wanted to include them. As the name states the products really do work and are so effective - I can't tell you how much I already love this brand! My absolutely favourite product is the Deep Sleep Pillow Spray which I was sceptical about but it's amazingly improved how quickly I fall to sleep and the quality of sleep I have - no more waking up during the night. As someone that's taken sleeping tablets in the past I'm so very glad I've found this natural product that works! This is certainly a new favourite and one of those that will be forever repurchased. An ideal gift for someone that struggles with sleep or relaxing. As for In Transit Camera Close-Up, again this is a product that just works and gets the job done amazingly well. This is basically a primer and moisturiser in one and creates the perfect base for makeup as well as brightening the skin. The Works also do quite a few gift sets that would make lovely gifts this Christmas. Sometimes it's nicer to spend on one luxury item than a few budget products especially for someone that enjoys high end beauty but don't treat themselves to it. Touche Eclat is one of those products that you can certainly give as a single gift as it's such a cult product that so many people love - I've been re-purchasing it for 10 years! Equally lovely products would be a single Chanel lipstick or nail polish! Lastly I had to include a favourite body product of mine that feels quite festive with the stunning rose gold accent packaging and name. This is a gorgeous sensual smelling dry oil that hydrates the skin a dream after a bath or shower. I love quite a few REN products now but this just feels such a luxurious product to me and and ideal for gifting to someone special. Over the years I've tried many a hair straightener but Cloud Nine are by far the best and a brand I wouldn't stray from now. For Christmas Cloud Nine have teamed up with designer, Emilio de la Morena to bring out this gorgeous limited edition velvet heat resistant bag that I can't get enough of. As for the hair straighteners these are the original irons that I really do prefer over the Cloud Nice Touch Irons as you can can control the temperature which is so important so not to heat damage the hair. Also the plates of the irons really are perfect and ideal for long, thick hair. This really is an amazing gift set and a real treat for someone that you may know is in need of new hair straighteners! On to one of the latest beauty gadgets now that I've been lucky enough to try out (I'm in the process of trialing it out for 6 weeks). This is the latest and the most portable home hair removal devices on the market today that offers safe and long lasting hair removal to the arms, underarms, legs and bikini line with a simple treatment once every 2 weeks to begin with and then once every 4 weeks to keep up the results. I tried my first IPL system years ago when they were heavy and tiresome to use but with the latest technology the lightweight portable device can be worked into your routine and takes 10 minutes per leg at most. I'm currently trialing this out on my underarms and I've already seen reduced hair growth and I'm actually seeing a few bald patches now - a full review to come! This is of course an investment purchase/gift to buy someone but finally the technology is there with it and now is the right time to spend on a device like this! Magazine subsciptions are are great gift to give at Christmas, they are the gift that keeps on giving over the coarse of the year and if the recipient is a fan of the magazine they will love it! UK magazine subscriptions cost around the £15-30 mark but I've found you can often subscribe to US titles for a little bit more if you order though the American website instead of a UK based website! This is something I've done for my sister in the past with Oprah magazine which she enjoys reading. You can order a 1 year subscription through the US Hearst Magazines website for $50/£33... and that's including the extras delivery costs! So it's totally worth checking out US magazine titles to give that extra special gift. John Lewis is one of my favourite places to shop at Christmas as it has so many wonderful unique gifts and this is one of them. Yes, it may only be a decorative box but I personally use it as a jewellery box as it's just so detailed and gorgeous. A gift like this maybe filled with some other little treats would make a perfect gift to someone that enjoys interiors. Other decorative boxes here including a smaller size of the Mansion box. There's something about receiving a large hardback book at Christmas, isn't there? Your Beauty Mark is amongst a few new makeup books this Christmas, which I've featured in my other Christmas guides, but this offers something slightly different. This book focuses on vintage makeup and hair as well as Dita Von Teese herself with so many wonderful portraits of her in the book. This would of course be a book for someone interested in old hollywood style makeup or in the makeup industry to pour over and have as a coffee table book. As you can see in the first image without the book jacket it looks quite a luxury coffee table book which is how I will be keeping it! 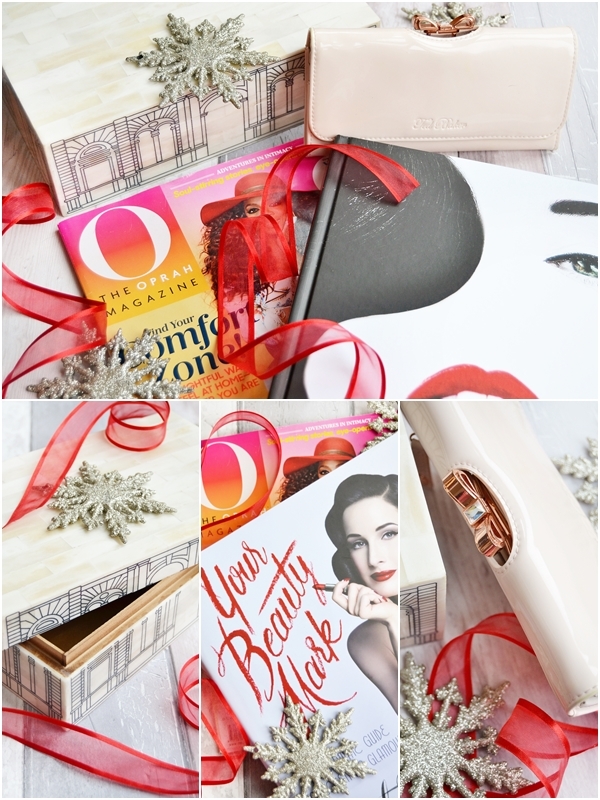 Just a wonderful quality book for admirers of Dita or makeup lovers. Lastly I had to include another little something from Ted Baker as I own quite a few pieces from them now and treasure them all - I love their Ikon bags! This is my own purse which I've had for over a year now and still absolutely adore. The quality and design is spot on and luxurious without costing over the £100 mark. A gift like this would be perfect for the friend or family member you spot using an old purse they've had for years and with some many different designs and colours you really can pick something that would suit their taste. Smaller purses are also available at around the £40 mark. Hope this has helped you with a few ideas!